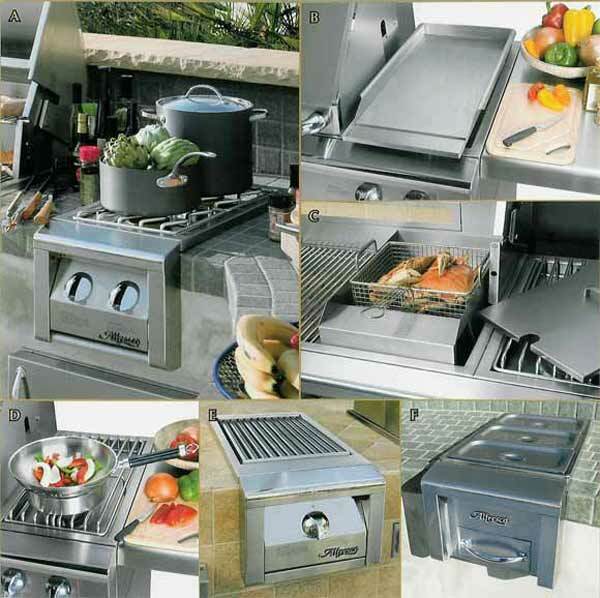 Alfresco offers the industry's largest selection of outdoor kitchen options. A. Dual Side Burner. All commercial stainless steel with heli-arc welded seams, featuring two 17,000 BTU burners with electronic ignition. Recessed top and s/s cover for protection from wind and elements. B. Commercial Griddle. 3/16" solid stainless steel plate with side and back splash, great for teppan, fajitas, breakfast or juicy burgers. C. Steamer/Fryer. Drops into any Alfresco grill to steam, fry or boil. All s/s. D. Wok and Wok Ring. All stainless steel, for use on the side burner or on the grill. E. Standalone Sear Zone. Our ceramic infrared searing burner in a convenient, self-contained unit. F. Food Warmer. Features 3 removable stainless steel food pans and a slide-out drawer for Sterno-type fuel canisters.